Now’s your chance to score an OPPO F3 and F5 at 50% off at Lazada’s 12.12. Grand Year End Sale! 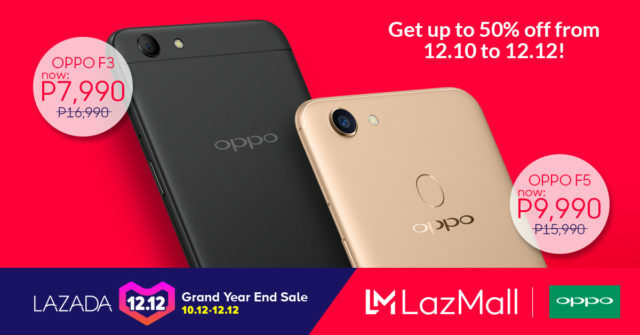 The promo will run from December 10-12, 2018 so head on over to OPPO’s official store in Lazada while stocks still last. You can also check out other units that are on sale. The F3 originally retails for Php 16,990 while the F5 originally retails for Php 15,990. You can now purchase these phones at a special discounted price of Php 7,990 and Php 9,990 respectively. Looking for a last-minute Christmas gift for your loved ones or for yourself? Don’t miss out on this exclusive offer!